This is such a special day to honor you. 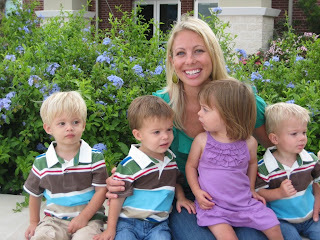 You are an absolutely amazing mother, who puts your heart and soul into raising our kids. While I might like to think it, I know for a fact I could not do what you do every day. Our kids are blessed to have you as a mommy. To make this mother's day even more special, we attended the baby dedication at church this morning. Busha attended the service with us and spent some time lovin' on the babies. We topped the day off at the pool. It's fun to see the kiddos splash around in the water and play with other kids. The best part of the day (any day for that matter) is seeing the smile on Mari's and the babies' faces. 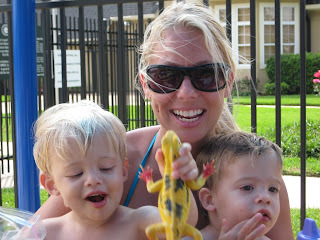 Cohen, Finn & Momma playing with "Lizzy"
We hope all you mommas out there had a great day! Happy Mother's Day Mari! You are an amazing mother to the kiddos! So much love! SOOOOOO precious!!! i love you, mare! hope you had a wonderful mother's day! Girl, you are a BEAUTY QUEEN. =) And the little G's get cuter by the post..i swear! And they are already off the charts on the cute factor!